People everywhere are using SeeClickFix to do amazing things in their communities. Here are a few examples of how real people are improving their neighborhoods and making civic life richer with SeeClickFix. Residents in New Haven used SeeClickFix to transform neglected public spaces into valuable neighborhood resources. Bike riders in Tucson got road hazards fixed and are now riding free ‘n easy. 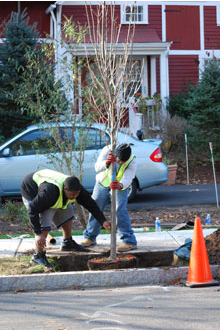 To help improve air quality and public health, lower energy bills, reduce stormwater runoff, and save their city millions of dollars, residents in Elm City began a campaign to protect and enhance their tree canopy. In Richmond, local government is using SeeClickFix to connect volunteers with resources needed to fix community problems. The City is providing refuse trucks and workers to assist with volunteer cleanup events. People in Huntsville shared their ideas for the future of economic development and planning in their community. They used SeeClickFix to discuss ideas, vote for each other’s suggestions and provide city planners with a wealth of data. “I’ve been risking life and limb for years crossing Whitney Ave. The intersection needs a crosswalk at minimum.” See how pedestrians reported concerns about a dangerous intersection. This organization is partnering with SeeClickFix in the war against neglected and overgrown public spaces. The Meriden Department of Public Works encourages residents to report potholes using the SeeClickFix website or mobile app. Residents have actually aided local police units and challenged crime in their communities. But there are many more reasons to use SeeClickFix. See a list of the types of issues you can report here. Stop waiting and start using SeeClickFix now! Learn the Htown Bingo rules and download the bingo board here.